NASCAR announced a new rule Feb. 4 for the 2019 season that will disqualify a driver from a race if they fail the post-race inspection at the track. Prior to the rule’s introduction, drivers faced fines and teams risked suspension if they failed the inspection after the race. If drivers who failed won, they still kept the win and points accumulated from the finish. Cars not in compliance with the rules threaten the spirit of racing, because drivers who follow the rules can lose to someone who broke them. NASCAR has struggled to catch drivers who broke rules in the past, but last season, the organization implemented lasers in the inspection process to remedy the problem. The biggest difference this season is that cheating drivers and crews will have their wins stripped away. 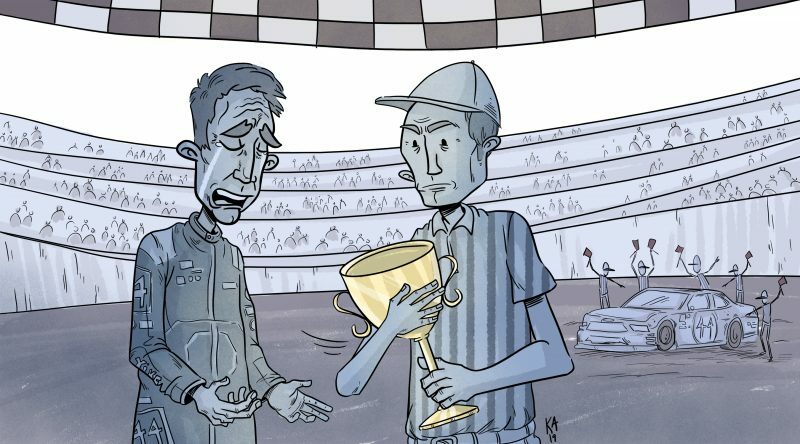 If a car is found to be illegal, the second-place driver will be awarded the victory. A car can be illegal for many reasons, including tampered engines and different measures of rear spoilers. NASCAR will enforce the new rule across all three national levels on its circuit — the Monster Energy Cup series, Xfinity series and the Gander Outdoors Truck series. Aside from disqualification from the race, teams will be given a last-place finish and points to go along with it. Their stage points will also be stripped, and if it is a playoff race, the team will lose the playoff advancement that came from the victory. The change in the rules will hopefully let fans know the winner before leaving the track, since inspections usually take days to find results. Fans can engage in the races more, because they know NASCAR’s transparency level when it comes to inspecting cars. In 2010, driver Clint Bowyer won the first race in the Chase for the Sprint Cup at New Hampshire. Afterward, his car was found to have not met official NASCAR qualifications. The Chevrolet did not have proper body template specs. If this happened in the 2019 season, Bowyer would not have earned points or the win in the first round of the NASCAR playoffs. Instead, Chesterfield native Denny Hamlin — who finished second — would have been awarded the win and everything that accompanies it. The last driver who was stripped of a win for cheating dates back to Dale Jarrett in 1995. Now, the hysterical culture of cheating in NASCAR will change for the better. NASCAR’s decision was needed, but it will not change how people race. The winning car, second-place car and a randomly selected car were already inspected after a race prior to the rule. The only effect the rule will have is the implementation of penalties if a driver’s car doesn’t follow NASCAR specifications. It’s one thing to talk about these rules, but when they are properly implemented, NASCAR will completely change. If a driver cheats, they do not deserve to win.